DOWNBEAT April 12, 1973 Big Bands! 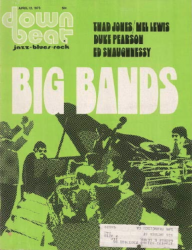 Downbeat magazines April 12, 1973 issue is all about big bands in their more modern iterations. From the groundbreaking sounds of Thad Jones and Mel Lewis to the Hard Bop inspired orchestrations of Duke Pearson, this issue has a comprehensive survey of the best big bands of the day, not to mention a striking cover!